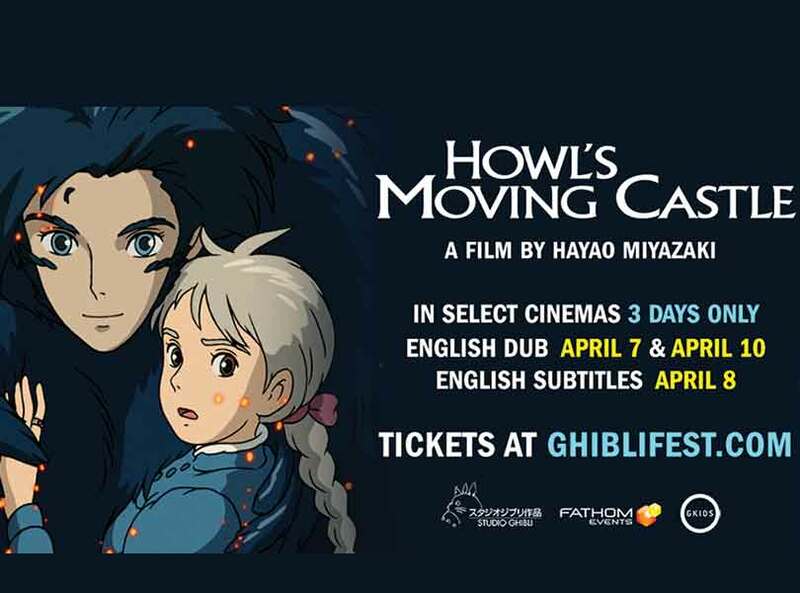 Hayao Miyazaki's iconic film, Howl's Moving Castle, will be returning to the big screen for a limited engagement this April. Originally released in 2004, Howl's Moving Castle earned $190,000,000 at the Japanese box office, and was at the time, the third most profitable film in the country, behind only Titanic and fellow Miyazaki classic Spirited Away. The film, which is based on a novel by Diana Wynne Jones, follows a young girl named Sophie, who is transformed into an elderly woman by a witch's spell. Her journey to reclaim her youth leads her through a war-torn world populated with colorful characters that leads her to the titular mobile kingdom. In recognition of the films fifteenth anniversary, Studio Ghibli, in association with GKids, will be bringing the animated classic back to the big screen in April. The English dub of the film will screen in select theaters on April 7 & 10, and the original version with English subtitles will play on April 8. Like most Studio Ghibli films, Howl's Moving Castle features an A-List English cast of voice actors, including; Lauren Bacall, Christian Bale, Billy Crystal, Blythe Danner, Emily Mortimer and Jean Simmons. The movie made several prominent critic's top films of the year lists, and won a number of awards, including the Venice Film Festivals "Osella Awards for Technical Achievement" and the Tokyo Anime Awards for "Animation of the Year", "Best Director", "Best Voice Actor", and "Best Music". The screenings are part of the larger Ghiblifest, which will see big screen appearances by several other popular films from the Studio Ghibli catalog. Sophie, a quiet girl working in a hat shop, finds her life thrown into turmoil when she is literally swept off her feet by a handsome but mysterious wizard named Howl. The vain and vengeful Witch of the Waste, jealous of their friendship, puts a curse on Sophie and turns her into a 90-year-old woman. On a quest to break the spell, Sophie climbs aboard Howl's magnificent moving castle and into a new life of wonder and adventure. But as the true power of Howl's wizardry is revealed, Sophie finds herself fighting to protect them both from a dangerous war of sorcery that threatens their world. Featuring the voice talents of Lauren Bacall, Christian Bale, Billy Crystal, Blythe Danner, Emily Mortimer and Jean Simmons.